Alfa Romeo Cross designed by Centro Stile Alfa Romeo is the mountain bike in which the elegance of shapes encounters the dynamis of the product and the cuttingedge technology of the components. This is where dynamism and refinement of volumes come together. Alfa Romeo Cross represents the perfect synthesis of style and technological excellence, elements which by tradition belong to the Brand. Made in Italy by craftsmen, its unmistakable line is inspired by Calandra Alfa Romeo whose shape, character and passion are all to be found in the bike. 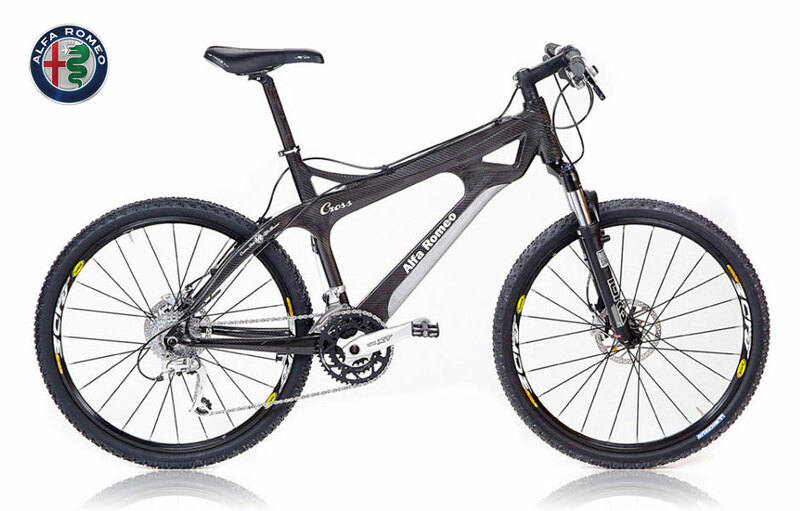 Alfa Romeo Cross is a superb, innovative, aggressive and safe mountain bike. The ultra-light carbon frame is assembled on strong and compact wheels, able to make Alfa Romeo Cross a bike firmly “gripped” to the ground. The colour black: the natural colour of the pure carbon fibre.